Bonus: GovLove will interview the wizards behind the social media accounts in Peoria & Vancouver later this week. Update: You can vote once a day. Multiple votes from the same IP address will be removed from the final vote total. Vote. You can vote once a day. Comment. A positive comment for your favorite city hall equals another vote. Tweet. Tweet your support using #ELGLCityHall for another vote for your favorite city hall. CityHallSelfie. A picture in front of your favorite city hall equals two votes. 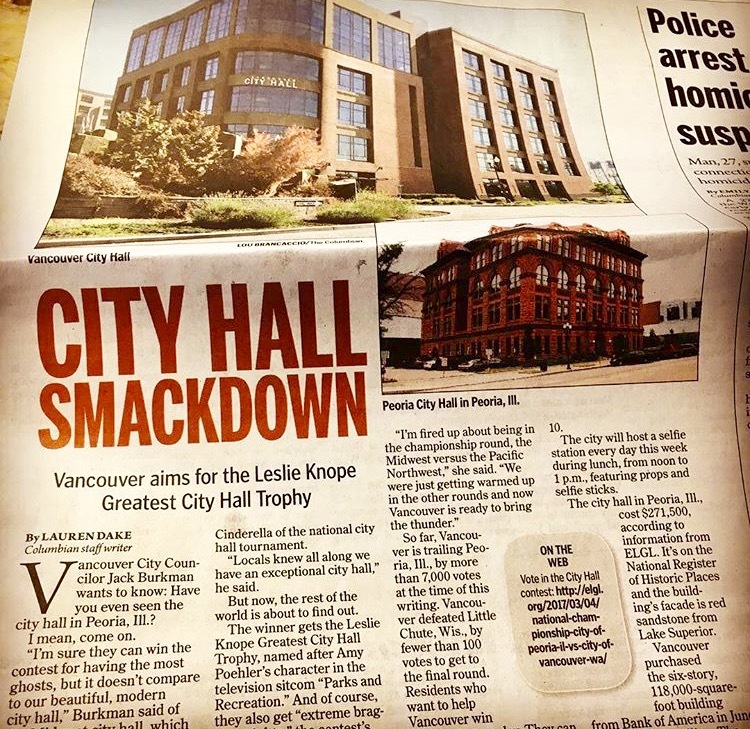 The winner will receive the prestigious Leslie Barbara Knope trophy, a complimentary ELGL organizational membership which includes unlimited job postings for the year, and extreme bragging rights. Check out a sampling of selfies from the ELGL Facebook page. Vancouver has their own impressive album of selfies. Peoria has posted numerous selfies on their Facebook and Twitter pages. Fun Fact: Golden State Warrior and Peoria native Shaun Livingston tweeted his support. WWCT: PEORIA’S BEAUTIFUL & HISTORIC CITY HALL IS IN THE FINALS! The building is Gold LEED Certified – meaning it’s design is energy efficient and environmentally-conscious! The City of Vancouver took strategic advantage of a tough real estate market and bought the new City Hall building and vacant land for $18.5 million – about half its actual value in 2010. Engaging Local Government Leaders (ELGL) is a big-tent organization with more than 1,900 members from across the country. ELGL is committed to increasing diversity and inclusion in local government through the #13Percent initiative, embracing new technologies, and communicating in a “human voice” to attract and retain the talented professionals. In 2016, ELGL hosted the first International City Hall Selfie Day which attracted more than 1,500 entries and highlighted the pride of local government professionals. GovLove, an ELGL podcast production, has produced more than 100 episodes with guests ranging from Gabe Klein, author of The Start-Up City, Ocean Quigley, former Creative Director at EA in charge of SimCity, George Hawkins, DC Water CEO, Leah Treat, Portland Bureau of Transportation Director, and Pat Martel, City Manager of Daly City, CA and former ICMA President. GovLoop has named ELGL a top government professional association and StateTech named ELGL a must-read state and local IT blog. “ELGL is among the most creative and insightful professional groups in the nation today,” says Matt Horn, City of Geneva, NY City Manager. “ELGL is Changing the Face of Local Government,” writes John Thomson, PayIt Founder. “ELGL is growing to be quite an influential organization among local government professionals in its relative short history. The ELGL leadership is innovative, creative and leading edge,” says Bonnie Svrcek, City of Lynchburg, VA, City Manager. “I continue to be encouraged and amazed at the effort ELGL and its members give to providing information and support to students and public service professionals so that they can be even more effective public servants,” remarks Bill Monahan, retired city manager.